Black Warrior River Among America’s Most Endangered Rivers in 2013. Proposed Shepherd Bend Mine Poses Direct Threat to Birmingham Drinking Water. 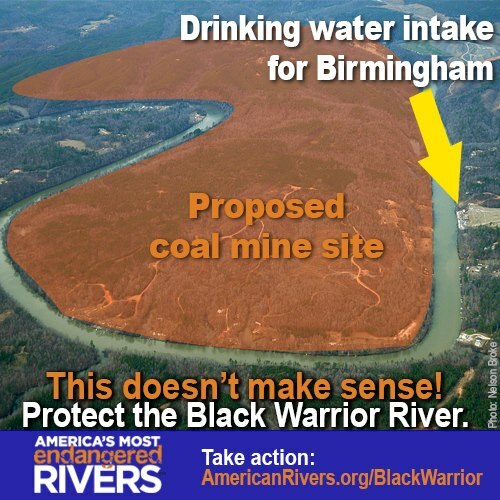 Washington, D.C.- American Rivers named Alabama’s Black Warrior River among America’s Most Endangered Rivers® of 2013 today, shining a national spotlight on a proposed coal mine that would threaten clean drinking water as well as river health, wildlife, and private property. The Black Warrior River is threatened by a proposed strip coal mine at Shepherd Bend on the Black Warrior River’s Mulberry Fork in Walker County. The 1,773-acre Shepherd Bend Mine would discharge wastewater at 29 points, including one that is 800 feet across the river from a Birmingham Water Works Board drinking water intake facility for 200,000 people. Mine discharges would introduce toxic pollutants and sediment into the drinking water source, elevating health risks and increasing water treatment costs for families and businesses in the greater Birmingham area. American Rivers and its partners called on the University of Alabama (UA) System Trustees to prevent the lease or sale of UA’s land and mineral rights to Shepherd Bend, LLC. That company is run by Garry Neil Drummond, a Trustee Emeritus of the UA System. A large and growing coalition of businesses, organizations, students, scientists, drinking water consumers, and other concerned citizens are urging the UA Trustees to take a strong stance against the mine, helping ensure that this valuable water source is protected for future generations. The Black Warrior River flows through a 6,276 square mile basin, providing drinking water to many of the watershed’s one million residents. The Black Warrior and its headwater streams, one of which carries a national Wild and Scenic River designation, are home to a great diversity of wildlife including 127 species of fish and 36 species of mussels. This river and its tributaries are a popular destination for fishing, paddling, swimming, and other forms of recreation.